Whether you’re flying halfway around the world it’s important to know your rights. As the recent disturbing incident involving a passenger violently removed from a United Airlines flight shows, few airline passengers are aware of their rights. What happens if you’re injured on a flight? What if another passenger assaults you? What if you trip over another passenger’s carry-on and suffer a concussion in the middle of the plane’s aisle? These are all incidents that can happen. And when you’re on an international flight, being injured on an airplane or in an airport can be especially overwhelming. Whether you’re flying halfway around the world for a business meeting, or you’re traveling to Mexico for a beach vacation, it’s important to know your rights. Fortunately, an international airline treaty provides passengers with the right to receive money damages for injuries sustained during international air travel. What Is the Montreal Convention? Created in 1999, the Montreal Convention provides compensation to passengers who sustain injuries on international flights. The U.S. became a signatory in 1999, and over 120 countries around the world have also signed — with more coming on board from year to year. Generally, passengers are covered by the Montreal Convention as long as they are traveling between two countries that have signed on. Furthermore, the passenger is covered even if they are injured while traveling on a domestic part of the trip, such as a long journey that involves a flight from Los Angeles, a layover in New York, and then an Atlantic crossing to London. In that scenario, the passenger would be covered even if the injury happened on the flight from Los Angeles to New York. 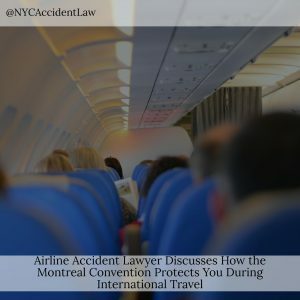 The Montreal Convention also allows injured passengers to file a claim in their own country, as long as the airline on which the injury occurred operates within the passenger’s primary country of residence. This eliminates the headaches of trying to bring a claim in a foreign country. If you have been injured in an aviation accident while flying domestically or internationally, protect your rights as soon as possible. Talk to a New York City airline accident lawyer today to discuss your options. New York airline accident lawyer Jonathan C. Reiter. T: 212-736-0979.